Having spent pretty much all my adult life teaching art to kids in one place or another, I am not a stranger to a mess. Through all that messy projects, one thing I have discovered is that for many kids the mess is what makes art and other projects so fun. Not really the mess itself but the ability to touch, feel and explore something in lots of ways, which is usually how they get the messy part. When I think back over the last few years home with my kids and all the projects we have done on this blog, the ones they really enjoyed the most, were often the messiest. The ones where they were most involved in, played the longest and asked to do it again, usually involved a good amount of messiness. Like most parents, I don't have a lot of extra time for cleaning but I have found that a little bit of mess making really isn't that bad to clean-up and is well worth the experience in the long run. Clothes can be washed, paint comes off feet and hands (even if it takes a few washes) and most things can be wiped down. Summer is the perfect time for making a mess mostly because you can often take your mess outdoors. So this week I we have been doing some of our favorite mess making projects, recipes and experiments. Cloud Dough has been, by far the most requested activity at our house since the first time we tried it. We spent a lot of time playing cloud dough this winter (which also meant a fair amount of me sweeping the floor and wiping down the table) because both girls love it and play for a really long time. I am thankful to take the cloud dough outside this summer, where the mess can be easily washed away with the hose. 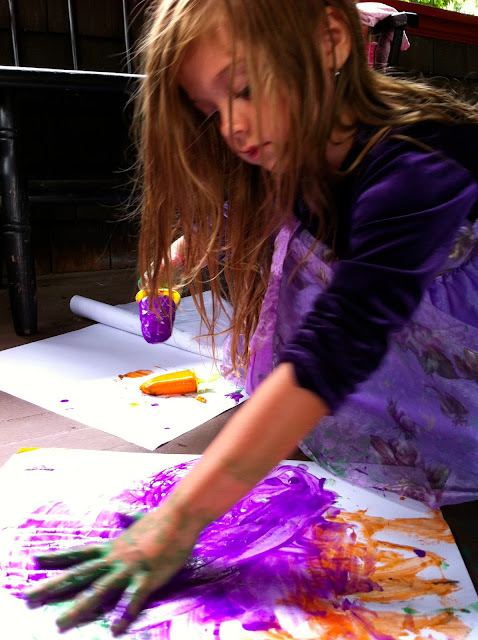 Of all the messy projects this week Spin Art is probably the least messy, making it perfect for a day indoors. We haven't done it in a few years, so I am excited to give it another try. The mess for this one is mostly in the clean up of the salad spinner, the kids actually stay mostly mess free. Gak was another winter favorite around here that I am excited to take outside. Gak is also one of those where most of the mess is in the making and cleaning dishes. The Gak itself is not overly messy but oh so fun to play with. We have been doing a lot of Painting with Frozen Paint Popsicles recently. So fun and oh so messy. Imagine how your kid looks after eating a Popsicle and after painting and you should have a good idea of the messiness. A great one for outside! One of our favorite outdoor summer activities is Sidewalk Chalk and Water. The chalk gets a little messy but we usually wear bathing suits and hose off or take a quick run in the sprinkler afterwards.